Tips on how to have a stress free Thanksgiving dinner and don’t forget to grab your FREE planner pack below! I simply love Thanksgiving. There is nothing I treasure more than the smell of turkey in the oven, family, and friends laughing around the table and football playing in the background. It is the trifecta of a perfect day. If you are lucky enough to be this year’s host of the big meal, the last thing you need on turkey day is to be stressed and frazzled. Yep, there definitely is no fun in that! This year, I want you to be able to enjoy the holiday as much as your guests will. And with just a few simple tips you will be able to do just that. Over the years of hosting dinner at our home, I have learned how to plan out the day so I am able to skip the stress completely and just enjoy the dinner along with my guests. As with anything, planning is the key to a smooth day. Learning what to do when will keep you from doing it all in one day. Instead, I want you to spread things out into small steps so you are doing a little every day. This is the key to any big task really, break it down so it doesn’t break you. This is my favorite part of Thanksgiving. Deciding what to make for the dinner. From the appetizers to the desserts the key is to write everything down on paper. Planning is so much easier if you have a visual and once you do, things are less likely to fall through the cracks. Make sure everyone is confirmed so you know what your headcount is. If you are asking your guests to contribute to the dinner, now is the time to finalize and adjust your menu and shopping list. Ninja tip: Are there things on the menu you hate to make? Enlist your family in friends to bring those dishes you am not too fond of. This will keep those dishes on the menu and also keep you from having to stress out over making them! Not a fan of cranberry sauce? Have good old Aunt Ida bring her favorite recipe and save you from having to make a dish you just don’t enjoy. Always shop your pantry and freezer first. There is no sense buying extras! Write down everything you need. Remember to refer to your guest list before you decide on the weight of your turkey. Don’t forget the drinks, seasonings, turkey bag, foil, toothpicks, and all of your ingredients. Walking through things in your mind will help you to remember the little touches such as a candle for the bathroom or mints in the entryway. You want to get everything down on paper. Everything. Remember you can always remove items later that your budget will not allow, but for now, the sky’s the limit! So easily things can get out of hand when hosting a dinner so for that reason you will want to set your budget early to help keep things in check. If there are extras on the list that your budget just can’t handle, maybe it’s time to think outside of the box? Is there something you can cut out so you can make room for something else? Maybe you can make decorative napkins rather than buy them? That way you can buy a new candle for the bathroom. Remember, it’s all a matter of give and take when you are on a budget. Even a tight one. If you are looking for ways to save money on your dinner, you can read 10 Ways to Save Money on Thanksgiving Dinner for more great tips. This is usually the week turkeys and all the fixings go on sale, so this is officially shopping week. Since I need more than one turkey for the year (buy what you need now since prices are at their lowest) I like to break my list up by the store to take advantage of all the sales. I prefer to do my shopping all in one day. 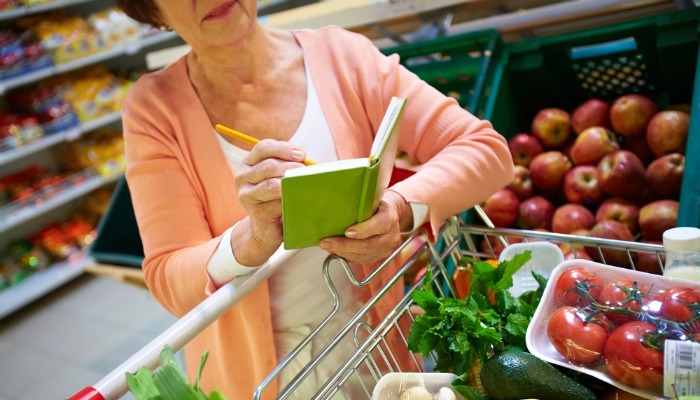 Fewer trips to the store saves time and money. You do not have to do all of your shopping in one day, the key to a stress-free Thanksgiving is to keep things simple. If a one-day marathon shopping binge isn’t for you, break those trips up to make it easier…..especially if you have little ones tagging along. Don’t forget to make a quick stop at the Dollar Store or a discount shop to pick up items for the “kids tables”. Consider using brown paper to cover the kid’s table and put a supply of crayons and colored pencils in the middle of the table. Add a few Thanksgiving stickers at each plate to keep your young guests entertained during dinner. If so don’t forget your furry friends when shopping, a fresh bone during dinner or a few cats treats is a nice way to ensure you are able to eat in peace. Not that I have a dog that begs for table scraps or anything! I just love to use cloth napkins for our dinner along with a cloth tablecloth. 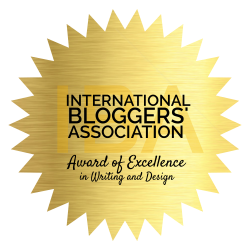 If you are like me, this is the time to get everything ironed and ready to go. Check for stains or areas that may need mending and correct them now. Ninja tip: Do you have a few stains or tears in the middle of your tablecloth? Don’t throw it out! There is nothing prettier than an elaborate centerpiece. Your job is to create one that covers all those stains and tears so you can at least get through just one more holiday without replacing things when prices are the highest. Instead get through this year and buy all the things you need AFTER Thanksgiving when you can score some crazy deals! This is the fun part of Thanksgiving for me. I just love to create rustic centerpieces using items I have on hand and bringing in items from outdoors. Candles, acorns, pine cones, and small pumpkins look lovely on a table and cost little or no money. Need just a little inspiration in this area? Check out my Pinterest page to find all the inspiration and ideas you will need! This is another fun part of turkey day. More often than not I like to do fun and comical place settings. You can get your creative juices flowing by reading my post Fun and Easy Place Settings. This post lists (and shows you) my top place settings that I have used over the years. They are super simple and require no crafting skills what-so-ever!! I have a couple of fun options there you can try all using items you have on hand. This is my number one tip for a stress-free day. The trick here is to map out every single minute of the day up until meal time. Trust me on this, you must map every single thing out for this step to work. Knowing exactly when everything needs to be started, prepped, or placed in the oven is such a huge stress reliever. With a timeline in place, you can then relax and just follow your list knowing it’s all on there and mapped out. The easiest way to set up your timeline is to decide at what time to serve dinner and work your way back from there. Make sure to include every single thing you need to get done that day no matter how minor it is. This way you know you have all your bases covered. Ninja tip: When setting up your timeline you really do want to include every single thing. Have little ones? Jot down at what time they need to shower and dress. And don’t forget to write in what time YOU are getting ready. Make sure not only appetizers are on the table when guests arrive, but you are dressed and ready to go as well. Take the time now to get things ready for the big day. When my kids were younger I would clean the guest bathroom and then lock it. That ensured at least one room was ready even if the rest were not. Get the deep cleaning done now so all you need to do that day is a once over to neaten things up. Go over your lists and check it twice. Make sure you have everything you need now when you have time to run to the store. Having guests over for the night? Prep those rooms now. Clean sheets, fresh pillows and a basket filled with toiletries and sweet trinkets as souvenirs are a great touch and takes so little effort. Ninja tip: do you have WiFi? 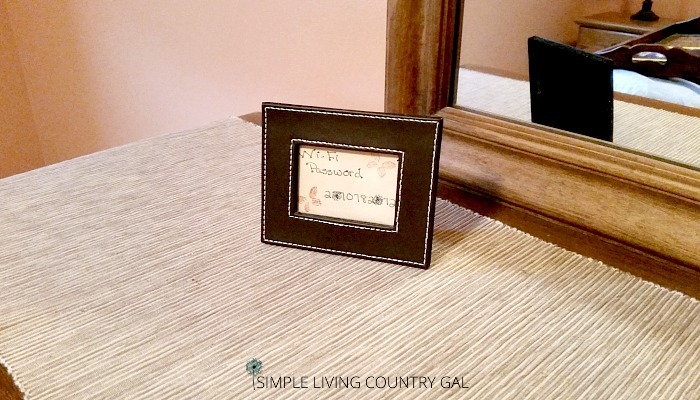 If so a cute little picture frame with your password is a wonderful touch in your guest room. I get comments on that picture frame every time I have guests. Try to think of touches that will help your guests feel at home and take the time to add them now. Also, make sure all clothing is ready for the family. Iron any shirts or dresses and do any necessary mending. Go over your menu and find those items that can be made early to help save time on the big day. Pies, mashed potatoes, meat and cheese trays, vegetable trays, cookies and any appetizers all can be done a day or two ahead of time. Yes, make those mashed potatoes the day before!! Once made put them into your crockpot (make sure you have one with a removable insert like this one) and then just begin to heat them up an hour or two before depending on how much you have. This is a HUGE time saver kids! 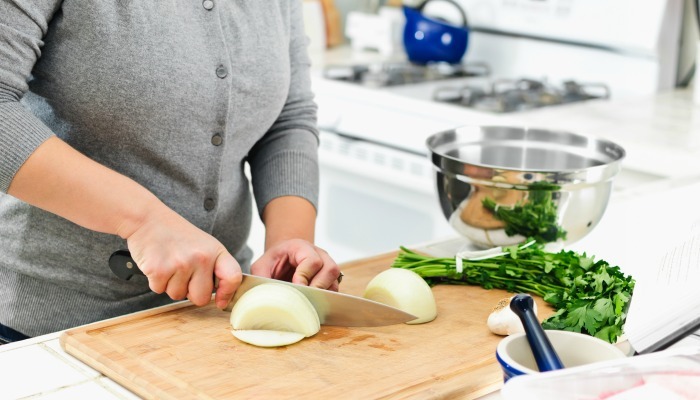 Also, you will want to prep any ingredients and have them ready to go. Nothing will ruin makeup quicker than dicing up a batch of onions for the dressing. Do it all now and seal in airtight containers. Label each container with a Post-It note so you can toss and go as you are cooking. If you have overnight guests, you may need to postpone this task until after breakfast is finished. If extra seating is needed, now is the time to get everything set up in a comfortable way. Be sure to allow room for your guests to eat without being overcrowded. Prepare a breakfast casserole that you can easily cook in the oven to save even more time and limit morning stress. I suggest keeping breakfast small, you want hungry guests at dinner time. Finally, go over your timeline and set your alarm….tomorrow is the big day! 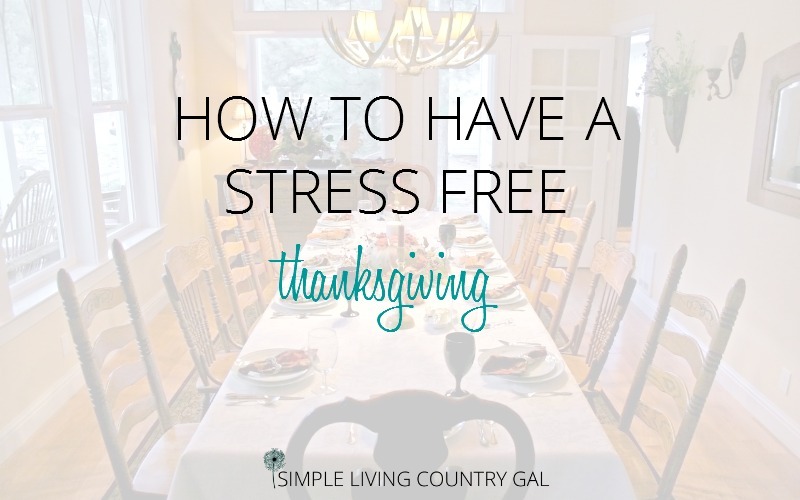 How to have a Stress Free Thanksgiving – Thanksgiving Day! Wake up, pour yourself some coffee and just follow your timeline. This is the beauty of this system. A timeline lets you walk instead of run through your day. Having such a large meal broken down into simple short steps is the key to a happy and pleasant meal. Now you too can relax just like your guests and be the envy of all! What tips do you like to use to have a stress free Thanksgiving dinner? Please comment below, I would love to hear from you! I am already late trying to be organized..lol. I was suppose to have started this list several days ago..argh. Well I suppose better late then never to get organized right? I am trying to plan a family Thanksgiving gathering for this year and though this is our 3rd year doing it this year we are having around 40 people there so I am feeling the stress already. Thank you for sharing these ideas, I am for sure going to be utilizing your list in hopes it makes my preparations less stressful and more enjoyable.